The 'M' Word - Marketing Libraries: John Cotton Dana Award Photos Are Here! John Cotton Dana Award Photos Are Here! It's time to look back at this year's John Cotton Dana Library Public Relations Awards, which were given out at ALA in June in Washington, DC. We have already posted the 2010 winners' announcement here, an announcement of the ceremony here, and a quick pic of Nancy with her award here. Now, however, I've managed to get the professional photos of all the winners, thanks to the award's sponsors: The H.W. Wilson Company, The H.W. Wilson Foundation, and LLAMA (the Library Leadership and Management Assn of ALA). I believe this is the first time that all the pics will be published anywhere! They will also appear in the Sept/Oct issue of my newsletter, Marketing Library Services, due out later this week. The omnipresent gentlemen in all the pictures are the event’s hosts, Harry Regan, Wilson’s president (far right in the first photo below), and Bill Stanton (wearing glasses), the Wilson Foundation’s president. 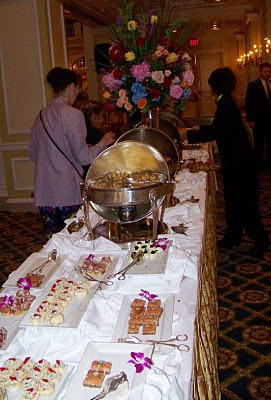 During the fancy awards ceremony at the beautiful Willard InterContinental hotel, guests enjoyed gorgeous flowers, lovely music, and a wonderful buffet. The JCD Awards are always an event worthy of America's most prestigious library PR prize. The M Word team was thrilled to be among the winners this year, and we're always happy to keep bringing you the best in library marketing news, ideas, and tips. We hope you'll keep reading!